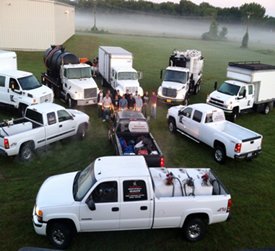 Enviro-Dyne is a Minnesota based company that specializes in Hydro Blasting, Hydro Excavation, Remediation and Video Inspection services for industrial and municipal customers. We are your resource to ensure efficiency with regular maintenance and cleaning of your toughest industrial or municipal tasks. Who will you work with at Enviro-Dyne? You will be working directly with the owner, Todd Finneman. Todd began his experience in the water jetting industry as a sewer jet operator and has now been around the industry for 18 years. It was not until his six years of working in the ethanol industry, that he saw the need for a quality, personal, reliable, industrial hydro jetting service. As a supervisor at CVEC, he saw ethanol plants spending thousands of dollars on mobilization and not getting the service they needed. With past experience as a Chief B Boiler Engineer, Todd has operated and maintained boilers within the plant and understands the importance of keeping the equipment clean. Enviro-Dyne has a great pool of talent that brings industry diversity to the company. Our team has worked throughout many industries like: ethanol, oil & gas, food processing, power municipalities, utility locating and the hydro excavation industry. Hydro Excavation is now considered the safest and only way to dig around utilities. We do this by locating the utility then excavating to remove soil from underground utility lines by using a non-destructive hydro excavator. Enviro-Dyne is able to slot trench across congested areas without damage to existing lines. It is the safest and most efficient method for excavating near any underground utilities, because damaging existing utilities can be costly in terms of project downtime and potential contractor fines. Enviro-Dyne Industrial Services believes in Safety First and takes pride in our no LTA record. We have achieved the because of our valued team of Supervisors and Operators. The equipment has also played a big role by reducing time, fatigue and some cases eliminating confined space entry. Enviro-Dyne believes in reducing your plant downtime and getting you back online ASAP. Call today to make an appointment! If you are in urgent need of our services call 320-314-8141, 24/7. When should you call Enviro-Dyne? Is it taking more energy to maintain production quota? Are heat exchangers performing below design? Are there signs of unexpected deposit accumulation within the system? Was there a hazardous spill larger than 5 gallons? Do you have a silo fire that needs to be extinguished? Does Enviro-Dyne take part in any industry associations? Yes, Enviro-Dyne is part of the Water Jet Technology Association (WJTA), whose members include high pressure water jet and industrial vacuum equipment users, manufacturers, distributors, researchers, regulators, and consultants. WJTA is international in scope with corporate and individual members throughout the world. We also support the Common Group Alliance (CGA)and is an alliance that supports non-destructive means for excavating.